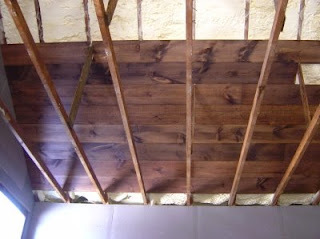 As slow as the last few days have been in terms of progress on the ceiling, today totally made up for it. We got six rows up, and are three rows short of the roof ridge. Most likely we could have installed one or two more rows, but we need to spend at least half an hour to move all the scaffolding for that, and we had to close shop early today due to a prior engagement. As we will box out the entire ridge line anyway, we decided to stop right there for the ceiling cover, and finish it, once the ridge line is boxed out. 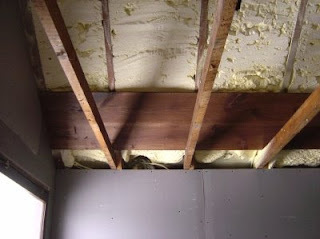 Granted, we could start work on that right away, but we are a little tired of ceiling work right now, and want to work on something else for a while. So stayed tuned for new and exciting things happening around Gunk Haus. 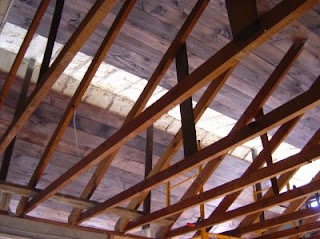 Back at the ceiling cover, we got two rows down today. 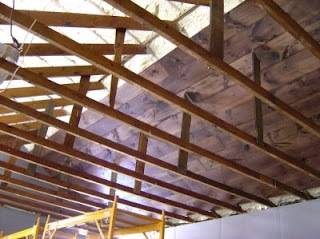 That isn't a lot, but the two rows were quite frustrating, as the planks were somewhat bent, and introduced large gaps. 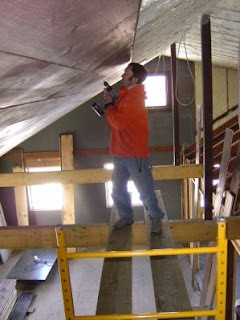 We should have about eight or nine rows to go to the roof ridge, so hopefully by Monday we get that done. Then it's off to new endeavors. 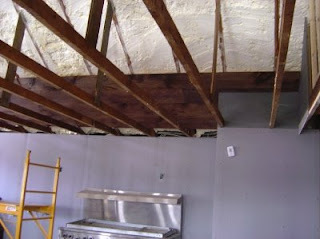 It has been long in the coming, but we finally cleared the hump in the ceiling from the old beer hall roof today. 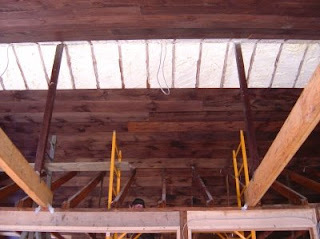 Aside from all the necessary notching and furring, the ridge is also hard to get to, because of the rafters and strap hangers. We spend a lot of time setting up the scaffold, doing work, tearing down the scaffold, moving it, and setting it up again. We'll get it done, eventually. We had Lou (our engineer) stop by today. 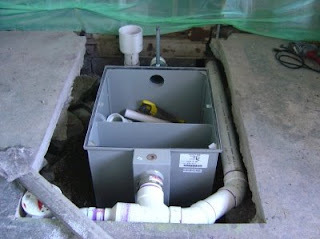 As a restaurant we have certain requirements from the Department of Health with respect to our septic system, and Lou is going to help us with that. Of course it works to our advantage that he knows the people at the Department of Health, and he speaks the technical language necessary to describe things. We have been very lucky with the people we work with in the sense that they actually work with us, and not just come here to make money. 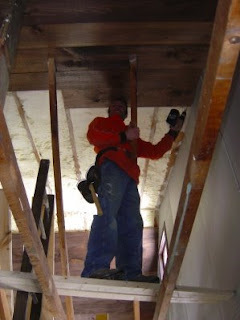 In the last 15 months or so since we started renovating Gunk Haus we have been blessed with an absence of injuries. Sure, there are occasional cuts, skin rips, and hammer-hits-thumbs, and our bodies are aching all the time from the physical work, but nothing major. Our tools and clothing have not fared so well. I have gone through several ripped pants, one pair of boots (though my old military boots are starting to go as well), and numerous work gloves. Today's victim was E! 's power drill. It did not survive the six foot drop off a ladder (I am sorry, Tom, to report its death, it didn't have to suffer though, but it was a fine drill all its life). So we set out to get E! 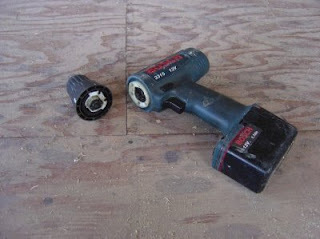 another power drill. That set in motion a whole journey across three counties, because our dear friend Jerry gave us this 10% off coupon for Lowe's, and I needed some tools, too, and oh, why don't we look for a new washer then. Therefore, another victim of today was the day itself, but we did get E! a fancy new power drill. We passed a crucial point on the ceiling, and reached a new one. There is a hump on the ridge line of the old beer hall roof (see picture below), which we need to get passed, but I already have an idea. But this has to wait, because tomorrow it is supposed to be warm, almost 40°F, in comparison to the last two weeks, that feels like summer. 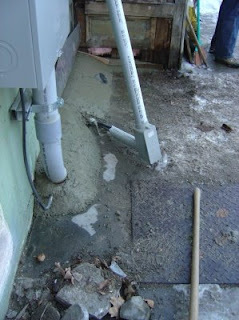 This won't mean that we take a day off, but that I will be able to pour some cement over the conduit from the new electric meter box into the house. The inspector wants it this way, so we'll do it. 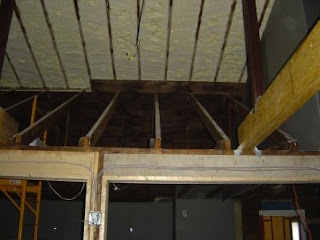 Did I mention that we were in a difficult section of the ceiling? We are installing the ship lap around the strap hangers, and that requires proper measuring and cutting, which sometimes isn't as proper and precise as I would wish. I had cut a difficult piece yesterday, but it wasn't right. So I cut another piece today, but it wasn't that great either. Nevertheless I didn't want to try a third time, it was good enough. Jeff (our plumber) stopped by today. 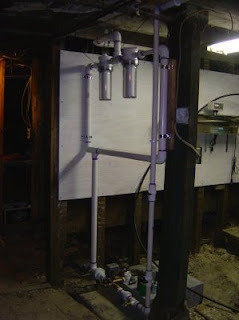 He installed the water meter, which is a requirement of the health department, despite the fact that we are on a well. After that we talked about air conditioning in the beer hall with him. 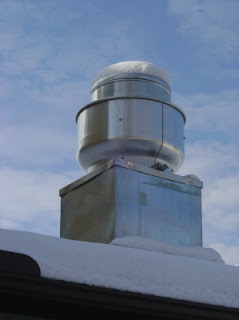 We came to an agreement on how to install the duct work in the most practical, yet stylish way. More drywall work today, finishing the length of the eastern wall of the beer hall, so that we can start installing the ceiling cover. We went to the winter farmers' market over at Robin's this morning. It is organized by Billiam of Liberty View Farm, just up the road from us. Anyhow, we met a lot of local farmers, which is key for us, as we want to source as much as possible from local farmers. For those of you interested in local foods and winter farmers' markets in our area, visit the Eat Local Food website. A little after 3pm E! and I had to leave, we wanted to look at a ten burner cooking range that was for sale in Marlboro. The range looks good and we may get it, we just need to figure out how to get it here. 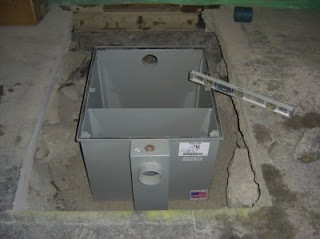 When we got back about two hours later, Jeff was gone, but he had finished the whole drainage around the grease trap. Unfortunately it was too dark already to take a good picture. I'll post one tomorrow. It still needs to be connected to the hot water loop, which I will prep for tomorrow. The actual hookup will have to wait, though, as it involves partially draining the pipes, and because I need to install another radiator on that loop, I'd rather wait and do it all at once. Plus, we're having a nasty cold front come through right now, and draining the pipes means no heat in the beer hall. We didn't do anything today, nothing, zip, zilch, nada. Ok, not true, we didn't do any actual work, but whatever we do is usually work related. Today we visited the construction site of E! 's sister's new home. 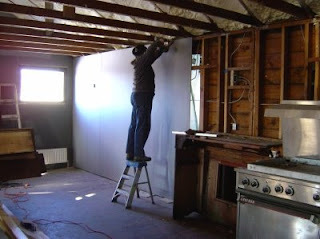 She and her husband are in the final stages of remodeling and adding on to an old farm house. 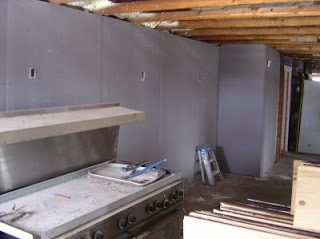 Right now they have the plasterers do their magic, and that is why we went there. 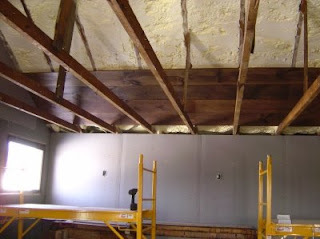 We wanted to see the magic, and talk to the plasterers. We had a good chat and got lots of good information. 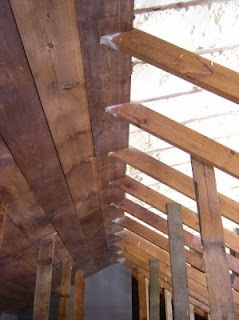 One info we got was a pointer to a lumber place, where we might find the kind of rough sawn lumber, which we are looking for to cover the beams in the beer hall. As the day was halfway over already we decided to head to the lumber yard, and check it out. We get there and find something we like, pack up the truck and are ready to leave, when E! points out the almost flat front tire on the truck. Always something. With the help of one of the yard workers and fix-o-flat we were on our way, and made it home safe. So, get excited, soon there will be some interesting changes. Today was a rather successful day, I got ahold of Matt (my favorite boiler man), he might be by on Friday, Jeff (our plumber) will return at the end of the week, I had a chat with Lou (our favorite structural engineer), and the electrical inspector was here and liked what he saw. We had an appointment today with our liquor license expediter. See, we are planning to open a restaurant and biergarten, emphasis on BEER! Like in most places around here, except for the North Pole, Antarctica, and a small planet in the vicinity of Betelgeuse, you need a liquor license to serve alcohol. New York State is none of the previously mentioned exceptions, ergo, liquor license required. We use an expediter to apply for our liquor license, that is a person in the know. It is worth the money, or else the headaches from dealing with bureaucracy would most likely make me start drinking (do I need a license for that?). Anyhow, two years ago Robin Hood took over New York State, and suddenly the rules changed. Robin Hood is long gone, having been caught with a shady lady, but the rule changes are still intact, and that caused the bureaucracy to become even more bureaucratic, and slow. We applied for our liquor license in February 2008, almost a year ago, and we may actually get approved pretty soon, i.e. in maybe a month or two. Granted, it doesn't matter right now that we don't have a liquor license, but imagine someone opening a wine bar, and not being able to serve the very beverage that defines the business. There were some issues and questions raised by the liquor authority, which we were able to wash away with a nice bottle of Pinot Noir ... kidding. 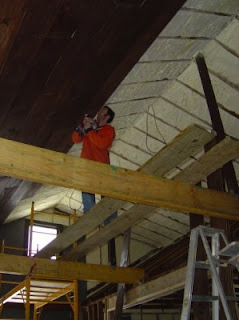 As we were out and about anyway, we drove around looking for wood to cover the beams in the beer hall with something nicer. We went to lumber yards and saw mills and got good advice and ideas, but we didn't buy anything, yet, still contemplating. So in that sense nothing was going on today. 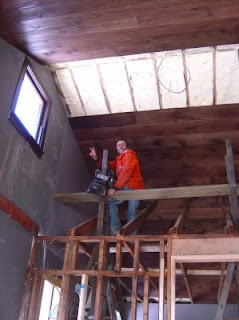 Yesterday we finally reached the top of the roof with the ceiling cover, only on one side of course. 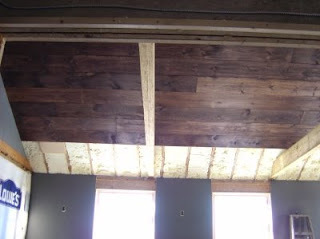 Actually we stopped a row short off the top, because I still need to install some support for the ceiling fans (yes, Tom, we will have ceiling fans in the beer hall as you may see from the wire loops hanging from the ceiling in below picture). 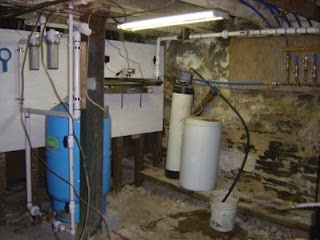 Also yesterday Jeff (our plumber) started work on the water treatment system. He should be able to finish by tomorrow. Today was filled with lots of little, and mundane tasks, like staining more wood, fixing the heat in the basement apartment, and book keeping (I never mentioned it, but having a company comes with various boring, but necessary, chores). There is one correction to the article I must insist on though: The name of the restaurant is Gunk Haus, NOT Gunks Haus, nor The Gunk Haus, nor Gunk House, or any other shenanigans. Gunk Haus! Off to today's work day. We moved higher up with the ceiling cover. 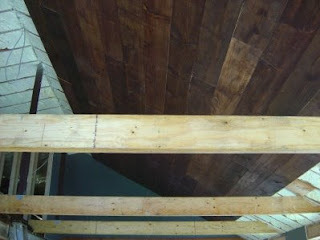 Unfortunately, we only have one scaffold, which is not enough to install the 16 foot long boards. 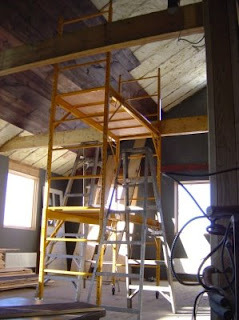 No problem, I just threw some planks over the LVL beams I installed last summer, et voilà we have another scaffold. No day without surprises, today it was heating related. I admit, that is not a surprise, but it never happens at a convenient time. Short story long, E! recognized that the heat on the second floor wasn't working. There was a time when that would have thrown me off, make me run for the freezer (where I store the vodka), and mix myself a nice martini with extra olives (thank you Amy and Mark for the nice martini glasses you gave me for Christmas, maybe I should mention next time I am out of vodka ... ;-). Instead, I casually walked into the basement, looked at the boiler check here and there, and find that the water pressure in the boiler is way too low, notabene water must be escaping from the system. 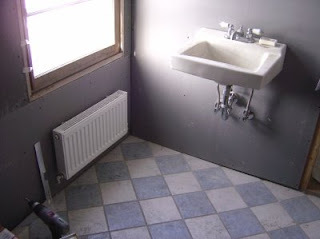 As we would have noticed water leaks on the upper floors and the beer hall rather quickly, there was only one place where the leak must be: the basement apartment. 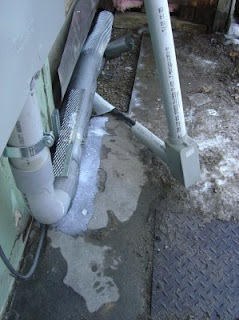 I go down there and sure enough, a heating pipe had burst, and water was gushing out. Not a biggy. 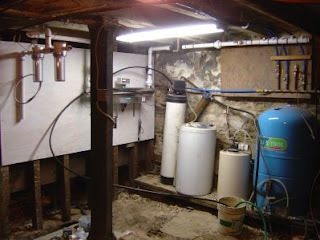 The basement apartment has its own heating zone, so I turn off the water for that zone, make sure the water pressure increases again in the boiler, quickly assess the water damage in the basement apartment, which was negligible, and call it a night. Champagne anyone? We got three and a half more rows up today, but it's already looking pretty shazam.